A unique opportunity you can take when you visit Charlottesville is a beautiful hot air balloon ride. This isn’t just a summer activity; it is great for any season, and truly perfect for the upcoming fall weather and scenery. If you decide to take a ride in a hot air balloon, you should dress casually. Don’t wear your best attire. Instead, you should be fine in outdoor wear like jeans and sneakers. The take off times are either right after sunrise or just before sunset, so dress comfortably for the weather during these times of the day. There are several ways to get up in the air in C’Ville, and here are three companies that can help you can take this journey. Monticello Country Ballooning is a company in the area that will pick you up and drop you off from the inn to the closest launch spot which is no more than 15 minutes away. The company offers private flights if desired, though you can opt to fly with others that are reserving their trip the same day depending on the price you’d like to pay. Their trips are all inclusive, so you’ll be provided with photos of the experience, a Champagne toast, along with the transportation we mentioned. They have a perfect safety rating, so if getting up in the air makes you nervous, you should know you are safe with this company! 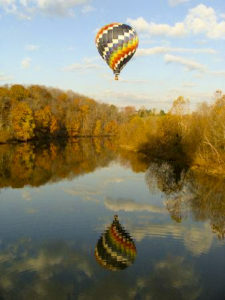 Blue Ridge Ballooning is another company that offers a similar experience. Their trip includes a Champagne tasting and they offer private trips as well. They do have smaller balloons, which means that you may be flying with less people than other companies if you do not opt for a private trip. The great thing about Blue Ridge Ballooning is they offer different packages, like a romance package or a wedding vows package that include extras such as photos of the trip and a picnic provided afterwards. Bonaire Charters is a great company that guests at the Inn often use. 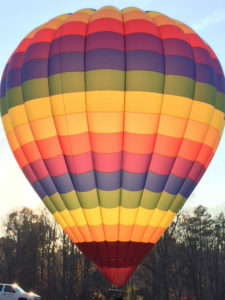 Scott Cohrs, the pilot, has been flying balloons over central VA for 23 years and is one of the most experienced pilots in the area. The traditional bottle of Champagne is included, and guests can request a different drink if preferred. Bonaire Charters will also provide digital photos included in the price so you’ll never forget the memories made on your trip! We hope you’ll enjoy a hot air balloon ride if this sounds like the activity for you when you stay with us in Charlottesville! This entry was posted in Charlottesville, Charlottesville VA, Engagements, Outdoor Activities and tagged autumn, charlottesville, charlottesvilleVA, hot air balloon, outdoors by Foxfield Inn. Bookmark the permalink.